What’s one of the first things you do when you enter a hotel room after a long day of traveling? Throw your luggage on the bed and sit down? Or flop down onto the bed to rest? According to Jim Dill, Extension Educator at The University of Maine, the bed is the last thing we should be touching when we first walk into a hotel room. You’ve probably heard of bed bugs — small, blood-sucking parasites that feed on mammals and birds. Adult bedbugs are reddish-brown in color, with flat, oval-shaped bodies that are 4-5 millimeters in length. Bedbugs are attracted to warmth, and they usually feed at night, making a hotel bed the perfect spot for them to settle in. These little creatures can be found almost anywhere, so whether you are staying at a hotel for the night, moving into an apartment, or renting a beach house for a week, your safest bet is to check the bed right away. Bedbugs can lay one to five eggs in a day, and more than 500 eggs in a lifetime. Their hatchlings are so small that they can pass through a stitch-hole in a mattress. 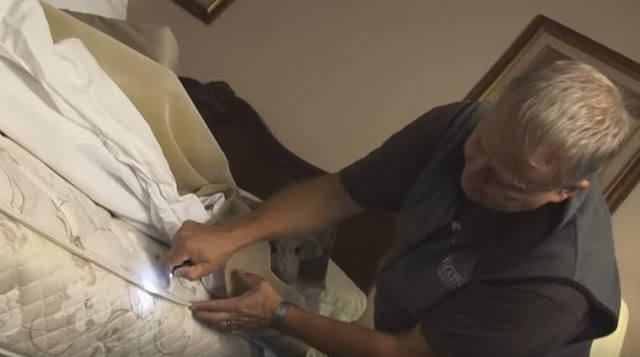 If you are officially grossed out at this point, here’s the good news: Jim Dill has put together a video to help us look for and detect bed bugs during our next hotel stay before we climb underneath the covers.